Hillary Clinton has secured enough delegates to win the Democratic nomination, according to the Associated Press. Clinton becomes the first woman in U.S. history to lead a major party in the race for the White House. She has reached 2,383 delegates, the exact number needed to win, as an additional block of superdelegates has apparently committed to vote for her at the Democratic convention in July. Clinton was expected to easily cross the threshold tomorrow, when six states hold contests. 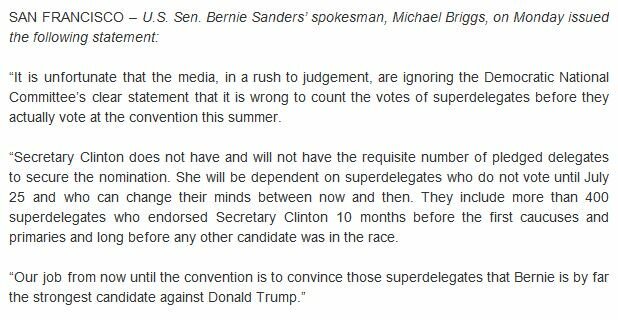 However, the AP apparently surveyed uncommitted superdelegates and found enough to get her to 2,383. We noted this as a possibility yesterday, as the AP did something similar on the Republican side, making Donald Trump the presumptive nominee on May 26th; earlier than the expected date of June 7th.